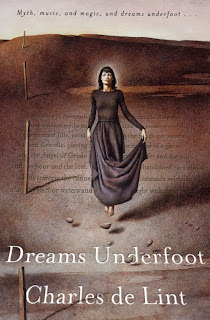 Charles de Lint is one of those authors I turn to when I need a dependable escape from reality that is sure to give me an emotional and mental experience that, when I come back out of my book, makes me feel refreshed, looking at the world around me with new eyes. I've read this short story collection several times since it was first published in 1993, and one day I noticed it was available as an audiobook through my library's digital collection. It was a nice change of pace to return to my beloved Newford through the narration of the aptly named Kate Reading, who did a great job bringing all the characters to life. If you've never read de Lint, you are in for a treat. Along with a wonderful series of characters who appear as protagonists in some stories and novels, and as minor or supporting characters in other stories and novels, he also writes about Newford, a fictional Canadian city that is just about a character in its own right. The short stories touch on new and familiar lives here and there, in and about Newford, featuring magical characters, normal everyday characters somehow touched by magic, mythical elements, gritty, edgy issues, young characters, old characters, and everything in between. As usual de Lint's love of music and the arts shines through in many of these stories, which is another element I always enjoy in his fiction. Kailana - I know what you mean. It's rough finding a balance between new books and old favorites. One thing it's done for me is make me a lot pickier about what I'm reading. I don't tend to slog through anything unappealing anymore. This was my first de Lint and remains my favourite, though I am very partial to Forest of the Heart and Jack of Kinrowan too. It's been a while since I read this collection, but the story with the birds? Turns me inside out every time. De Lint is a great author to turn to in those situations. Wow, can that man tell an engaging story. This is one of my favorite collections of his. I generally try to read a de Lint book every spring. There is something magical about that time of year that seems to make his stories even more powerful for me when read then. Carl - I totally agree. He is such a great storyteller! Spring and de Lint are definitely a great combo.